PSSST! Make sure you read to the bottom and get your free bounce lettering practice sheet! 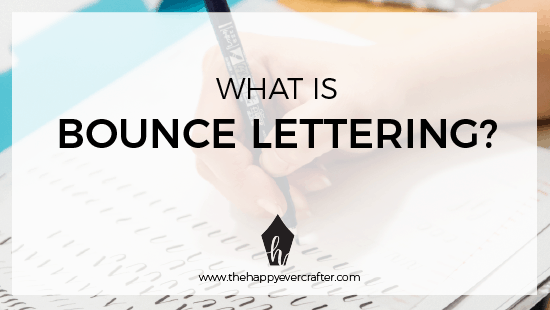 So you keep hearing this term- “bounce lettering” and wondering what it means? We’ve all been there as beginners (myself included!). Well, bounce lettering is sorta a vague term. In simple terms, it means exactly what it sounds like: lettering that looks bouncy instead of all rigid on one line. BASELINE: this is the line your letters sit on- and this is the one we’re going to play with most! X HEIGHT (green X): this is the height of the main body of your letters- so in the example, the oval part in each letter. When you’re learning calligraphy using your basic strokes, it’s important to stick within the guidelines above. Once you’re comfortable with the styles that stay within those boundaries, you can begin to break the rules. And that’s where bounce lettering comes in. You will often also hear this referred to as “bouncing baselines”. Why? Because to bounce your lettering, you will begin to selectively ignore the baseline. In the example below, notice how some of the letters dip below the baseline? This is the fundamental idea, and the easiest way to start adding some more character to your letters! Once you’re comfortable with bouncing the baseline, you can also try playing with the waistline (k, I realize that sounds bad…. LOL). In the example below, check out the difference it makes when you selectively ignore the baseline and the waistline. Now… this is a very simplified example. Bounce lettering can be extremely challenging- and if you don’t do it carefully, your work can easily turn messy. Although bounce lettering is meant to be a freeform, whimsical style, there are still some general guidelines that you should be following. Ready to learn my 4 basic guidelines and give bounce lettering a try? Good! Cause I’ve made you a free traceable worksheet. Just enter your e-mail in this form, and I will send you the worksheet right away! Make sure to also check out www.showmeyourdrills.com, too- this is where you can get instant access to a big Archive full of my free worksheets, videos & more to learn calligraphy! You are the best!!! Thank you so much. Just what is needed on a cloudy Moday morning! Your generous outreach is greatly appreciated. Regards! Encouraging to see the use of guidelines and their terminology. Thank you! I am so excited I’m ‘bouncing’ in my seat! Thanks, Becca! <3 You’re the best!!! Thank you so much, lots to learn but know this is the penultimate spot to doing so!!! Thank you! Can you recommend a pen for this script? I love the way you take your students from basic and it is easy to understand. Thanks Becca. You are the best lettering and calligraphy teacher!! Looking forward to the bounce lettering class. Thanks a LOT Becca !!!! Hi from HONDURAS!! I love all that you provide for your students! You’re a great teacher and I appreciate all of your hard work! Thanks for everything! Hi Becca, thank you so much for sharing your talent. I am still working on my drills. I love brush lettering, but it still intimidates me. I hope in time I can be half as good as you. Becca you make this awesome course so fun to be a part of! Thank you for having such a lovely presence all the time! Thank you very much for all the free worksheets. You are an excellent teacher! So generous of you! I keep trying to jump in where i can and this was just the pick up i needed to get going again! Your work books and practice sheets make it very easy to excel, that even a 65 year old(like me) can do it. So excited to get bouncin! These are great! Thanks Becca!! LOL! Glad you like it!!! Thank you, Becca! The bouncy style is so interesting and fun to look at, but so hard to get the hang of. This will help! Becca, please send me the free bounce lettering practice sheet. Hi Sheri, you can enter your name/email in the form at the bottom of this blog post and I will send it to you! Hope you are doing well. Thank you for the worksheet. You are awesome! Ok, totally behind, but enjoying every minute. Thanks Becca for putting this all together. WIll you please send me the bouncy worksheet ?